Similar in size to the Protex BG-20 Eletronic Hotel Safe, this safe offers additional security in the form of fire protection. A great choice for any business needing to store small valuables for employees or customers (e.g., hotels, spas, hospitals, clinics, and fitness clubs). Also makes a great safe for renters or to place in a boat or RV. Heavy enough to deter burglars (and can be drill-mounted into the floor), yet still maneuverable and easy to move. And this safe is rated at 30 minutes fire protection, too. This item ships via UPS. 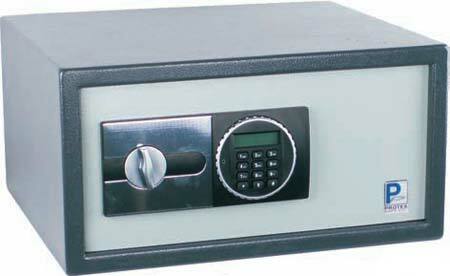 Please call to confirm orders of more than 10 of these safes.